The gorgeous C key oboe adopt for bakelite body, silver plated keys, solid rod system. It is consisted of user-friendly reed, durable 2 section body and bell. Its best combination of expressive and brilliant, comfortable feeling and exquisite workmanship, perfect for solo or orchestral wind instrument. C key, semi-automatic octave key, expressive and brilliant tone, perfect for solo or orchestral wind instrument. Gorgeous body adopt for bakelite, cupronickel key plated with silver, comfortable feeling make your playing fluent. Solid rod system, high quality blue needle spring, with compact construction and durable quality. User-friendly reed and metal mouthpiece for producing melodious tone. Soft wood port for closely connecting the 2 sections. Great leather packing offers it good air tightness. 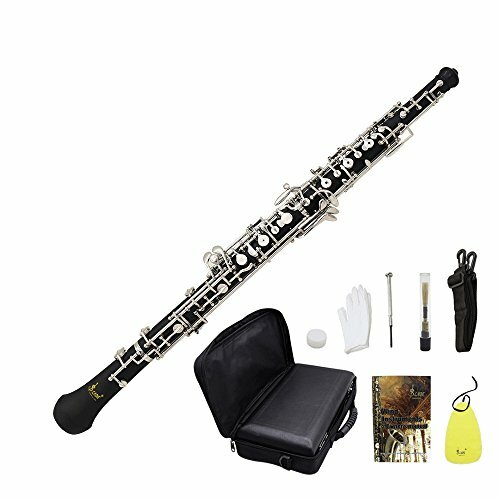 High-grade synthetic leather case and durable bag for better protecting your oboe. Comes with reed, gloves, cleaning swab, lubricant, screwdriver, leather case, carrying bag with strap and instruction.